As a late bloomer, I didn't have the same relationship trajectory as many of my friends, and consequently turned to other resources (namely comics, movies, and good ol' TV) for advice to guide me through the mire of early relationships. For a lot of people, the holidays are a lonely time. With New Year's Eve being two weeks from tomorrow, folks start thinking about who they'll be kissing when the clock strikes twelve. So here are the relationship tips I carefully culled in my youth, to make your holidays, and hopefully 2011s, a little cuddlier. 1. Know who you are to one another. I can't count the number of relationships I've been in where the parties involved did not view things the same way. There was that one guy who did not seem to agree that we were exclusive, and that other guy who thought the same... okay, I can count them. There were two. For a seemingly simple aspect of any relationship, definition is where many folks go disastrously awry. The most foundational aspect of a relationship is to know, and agree on, who you are to one another. 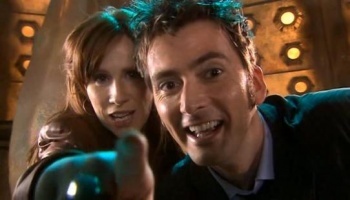 Before you all freak out on me, let me say I'm very aware that Donna and the Doctor were not "a couple." That's what made them so fun to watch. Rose and the Doctor were obviously nuts about each other, and Martha was nursing a serious crush from the moment the Time Lord kissed her in the hospital on the moon. (Man, I love this show.) From the moment they met, though, there was no indication that Donna and the Doctor would be anything but friends, a message broadcast from the beginning when we met Donna as an angry woman in a wedding dress. These two worked because they knew exactly what they were to one another. They were as close as two people could be, but there were no romantic entanglements, and that was fine. They were on the same platonic, adventuresome page. This advice does not mean I think you should rush out and define nebulous things right away (see #6), but having a common ground on which to stand is essential for any relationship worth its salt. This is a mantra that I wish everyone would adopt for every aspect of relationships. Then again, I've already opened two of my Christmas presents, so I may not be the final word on patience. This applies everywhere: Be patient getting a relationship off the ground, be patient with one another's foibles, be patient, period. You're two different people, and no matter how in sync you may be, you will never be inside one another's heads. There will be miscommunications and misunderstandings. Things will be a mess. Be patient. 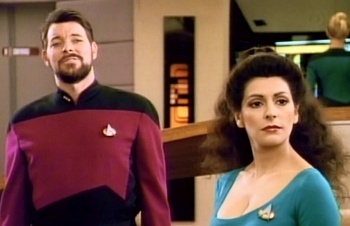 We sat through seven freaking seasons of Star Trek: The Next Generation knowing that Will Riker and Deanna Troi were, at some point, going to get the old band back together. Sure, Deanna dated Worf for a while, and his transporter-twin Thomas made a decent attempt at wooing her in Will's place. Their history pre-dated the show, and their eventual wedding followed it, but during the series' run, we got nothing. That doesn't mean everyone watching didn't know what was happening, and couldn't see the reunion a million light-years away. Still, we were patient, and they were patient, and their patience prevented the show from being overly weighted down with unnecessary drama and missed romance. Patience yielded a three-way win here, and can do similar wonders in almost any circumstance. 3. Listen to one another and tell the damn truth. Duh. Talk, tell the truth when you do, and listen when your partner does. It seems so simple, but goodness gracious, does this advice go by the wayside. Being lied to by a trusted partner hurts like the dickens, and not being listened to is nearly as bad. This advice could save everyone a few huge fights, and prove savior to some beautiful relationships, but people don't seem to want to take it. Don't be those people. Take this advice. I wanted these two to work out, I really did. The evolution of their relationship was one of the most natural I've ever seen on a television series, and they suited one another so well. Willow Rosenberg and Tara Maclay were doomed from their first fight, though, and their rekindled relationship wouldn't have lasted, even if it hadn't been marred by a big bloody tragedy. Willow didn't listen to Tara's concerns, lied about fixing them, and erased the woman's memory to negate having not listened and then lied. This was all part of Willow's downward spiral to set her up as a Big Bad, but that doesn't mean this relationship's destruction wasn't painful to watch. This isn't to say that Tara had never lied or hid the truth; when the character first came onto the scene, I thought she was going to turn out to be evil or sketchy. She turned out to be neither of those things, and I was crushed to watch Willow break some cardinal relationship rules just to sustain her addiction to magic. Don't do magic, kiddies. More importantly, talk, listen, and tell the truth.